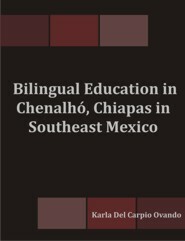 Using a qualitative ethnographic approach, this research investigated the situation of the Tsotsil language spoken in Chenalhó, Chiapas, Mexico, by focusing on the implementation of a Spanish-Tsotsil bilingual elementary school. It was possible to discover that the Tsotsil language is still alive and that most parents who participated in this research transmit it to their children. However, there are students who prefer Spanish instead of their native language Tsotsil, due to the negative attitudes they have towards it such as “it is the language of old fashioned people while Spanish is the language of fashionable and modern people.” Nonetheless, most students portrayed positive attitudes towards both languages. The barriers that have affected the promotion of Tsotsil are: a monolingual approach and curriculum that favour Spanish, lack of resources in both languages, lack of training for instructors to teach with a bilingual approach and negative attitudes toward the native language. Karla Del Carpio is a Mexican teacher of Spanish in the Department of Modern Languages and Cultural Studies (MLCS) at the University of Alberta, where she completed a Master’s in Applied Linguistics at the MLCS Department and a Ph.D. in the Department of Secondary Education. Karla has a Bachelor’s degree in Teaching English as a Foreign Language from the University of Chiapas, Mexico. She has taught English and Italian in Mexico and has worked as a language instructor for the last 12 years.